umati will only be accept­ed as a stan­dard if as many com­pa­nies as pos­si­ble use it. The umati pre­sen­ta­tion at the AMB (includ­ing press con­fer­ence and stand) was com­ple­ment­ed by a well attend­ed infor­ma­tion event for VDW mem­bers. The aim was to pro­vide infor­ma­tion first-hand. Dr. Alexan­der Broos from the VDW explained the back­ground to the project and the plans for the future. Caren Drip­ke from the project part­ner ISW (Insti­tute for Con­trol Tech­nol­o­gy of Machine Tools and Man­u­fac­tur­ing Sys­tems) of Stuttgart Uni­ver­si­ty gave an insight into the exist­ing seman­tics and pre­sent­ed use cas­es and para­me­ters. 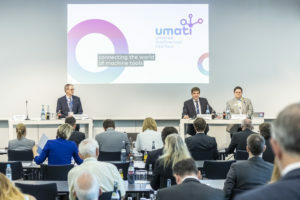 umati is a uni­ver­sal machine tool inter­face that can inte­grate machine tools and sys­tems safe­ly, seam­less­ly and effort­less­ly into cus­tomer- and user-spe­cif­ic IT ecosys­tems. umati con­nects machine tools to IT sys­tems inside and out­side the pro­duc­tion envi­ron­ment (MES, ERP, Cloud, …). umati pro­vides stan­dard­ised seman­tics and an infor­ma­tion mod­el based on OPC UA. umati con­tains spe­cif­ic exten­sions for man­u­fac­tur­ers and users of machine tools. umati pro­vides a stan­dard not only for Ger­many, but for users all over the world. Para­me­ter def­i­n­i­tions based on use cas­es (OPC UA pro­ce­dure), e.g. How can I use umati and what does it cost? The use of umati sim­pli­fies (and reduces the effort required for) con­nect­ing a machine to the customer’s IT infra­struc­ture. Few­er staffing resources are required, projects are com­plet­ed faster and costs are reduced. umati is an open, freely avail­able stan­dard based on OPC UA. There are no addi­tion­al licence fees for the use of the umati com­pan­ion spec­i­fi­ca­tions on your own product’s OPC UA serv­er. Spe­cial­ly devel­oped soft­ware com­po­nents needs to be licensed. When and how can I par­tic­i­pate? The con­cept is cur­rent­ly being devel­oped in a small, closed work­ing group, as it requires a high lev­el of com­mit­ment, inten­sive dis­cus­sion and mutu­al trust. A first review will be con­duct­ed in an extend­ed cir­cle of select­ed par­tic­i­pants in the fourth quar­ter of 2018. From the begin­ning of 2019, the Joint Work­ing Group (JWG) of the OPC Foun­da­tion will start a review process in which all stake­hold­ers can par­tic­i­pate. The goal is to cre­ate an OPC UA com­pan­ion spec­i­fi­ca­tion. Most of this process should be com­plet­ed by EMO Han­nover 2019; a Draft Com­pan­ion Spec­i­fi­ca­tion and a Release Can­di­date should be avail­able at least. Inter­est­ed com­pa­nies can join the ini­tia­tive at EMO Han­nover 2019; the announce­ment will be made towards the end of the first quar­ter of 2019. A design freeze of the Com­pan­ion Spec­i­fi­ca­tion will be imposed for the EMO Han­nover 2019 imple­men­ta­tion. If you are inter­est­ed in col­lab­o­rat­ing in the JWG or becom­ing a part­ner for EMO Han­nover 2019, you can pre-reg­is­ter on the Inter­net at info@umati.info.